When I was a young law firm associate, one of the most difficult lessons I had to learn was the importance of overwhelmingly careful attention to detail. If, as a law student, you have a typo in a paper, or even an error of fact, your grade is unlikely to change dramatically. In the real world, it is a different story. A typo in a brief can ruin your credibility with partners, and erode it with the court. It isn’t that the errors are damning in themselves. It is the concern they raise about a possible lack of care in other, more relevant ways that aren’t as obvious. Did the lawyer run down all of the precedents? Did he miss a nuance in the precedents? Were quotes copied carefully? This brings me to the Hillary Clinton campaign rollout yesterday. 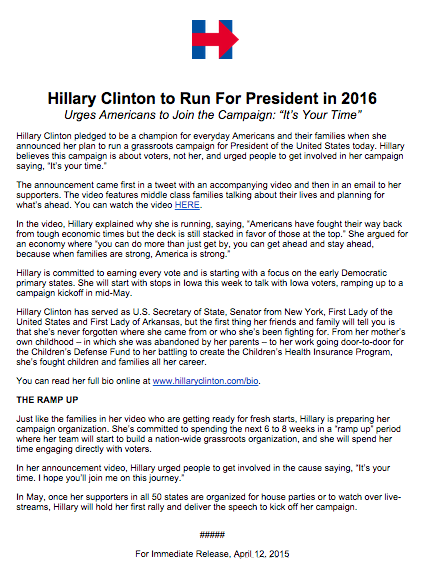 The video was delayed, and ended up being pre-empted by an e-mail from her campaign manager. The press release had a typo, claiming that she had “fought children and families” her whole career. Her TweetDeck photo was positioned such that the checkmark covered her eye. Whatever you might think about the logo, it wasn’t as powerful as Obama’s. It may well be that the lines on an “H” are never going to produce an image as visually pleasing as an “O,” but even taking that into account, the little things were off (the arrow pointing rightward, for example). If Hillary loses, it won’t be because of a typo in her campaign announcement. There were also good things about the rollout: The actual video was solid. But like her famous email press conference, the risk is that the mistakes are indicative of a deeper problem. These little things are minor, until it emerges that a higher-up in the campaign doesn’t know that the delegates in the nomination battle are awarded proportionally. Then, suddenly, there is a problem. If the race is close, the little things really can make a difference. The brand new 2016 presidential campaign of Hillary Clinton will embrace "small donors in early fundraising," according to a Monday Politico story. The second-time presidential candidate wants to "make even small-dollar donors feel like they are part of the inner circle." Based on the campaign's website, however, expectations for those "small-dollar donors" who speak Spanish are considerably lower than those for their English-speaking counterparts.